Week 3: Experts in authoritarianism advise to keep a list of things subtly changing around you, so you’ll remember. Observation: each week the list is getting longer, and more troubling/frightening. SPLC issued a startling report on the profoundly negative impact of the election results on our schools and children. This in addition to 867 cases of hate attacks in the 10 days post election, and 892 active hate groups. Trump continues to be disinterested in availing himself of daily intelligence briefings. Our news cycles are now being led by Trump’s Twitter account. Our media seems unable to do anything but follow along. Trump sent a total of 13 tweets on Jill Stein’s recounts, the most consecutive tweets on any subject. Still not a single tweet condemning nationwide hate crimes carried out in his name. Trump tweets there were “millions of people who voted illegally.” Kellyanne Conway and other loyalists parroted and embellished this false claim during the week. Despite his claims of millions of illegal votes, Trump and the GOP apparatus aggressively filed lawsuits to prevent vote recounts. Trump retweeted a 16 year-old’s tweet attacking a CNN reporter. The 16 year-old complained that Trump edited his tweet. Kellyanne Conway scolded a 17 year-old, in response to the girl’s question about working for a man with a history of sexual assault. Senate Majority leader Mitch McConnell awoke from a seeming slumber to condemn this, while Speaker Paul Ryan assured America he was tutoring Trump on the Constitution. Trump’s campaign held a cyber Monday sale on Trump merchandise at its online store. Russia claimed to be in talks with several people on the Trump team regarding Syria, before Trump takes office. After spending the entire general election criticizing Hillary’s email practices, Trump considers Gen. Petraeus for Secretary of State, despite a requirement that the General notify his probation officer in order to leave North Carolina (fortunately, there’s no travel entailed in the SOS position). Trump continued to conduct his SOS selection like episodes of The Bachelor. Romney was shamed into a public apology-lite remarks after feasting on frog legs, only to find days later, the current and former CEOs of Exxon had been added to the contestant list. Under continued pressure, Trump tweeted he would leave his businesses, but offered little detail or comfort this would be anything but having his children run things. Hardly arms-length. Eight members of the Senate Intelligence Committee wrote a letter to President Obama, urging him to declassify information related to Russia’s interference with our election. Although 17 intelligence agencies have said Russia was involved in hacking, the public is aware of no response or actions that have been taken. Bahrain — the same Bahrain that Trump falsely chastised Hillary for allegedly accepting donations to the Clinton Foundation from — booked space at the Trump International Hotel in DC for a reception. Even Trump loyalists (see image below) rebelled at Trump’s appointment of Goldman Sachs execs to his cabinet and inner circle. Since election day, GS stock has rallied by 23%, or a 347% annualized return. 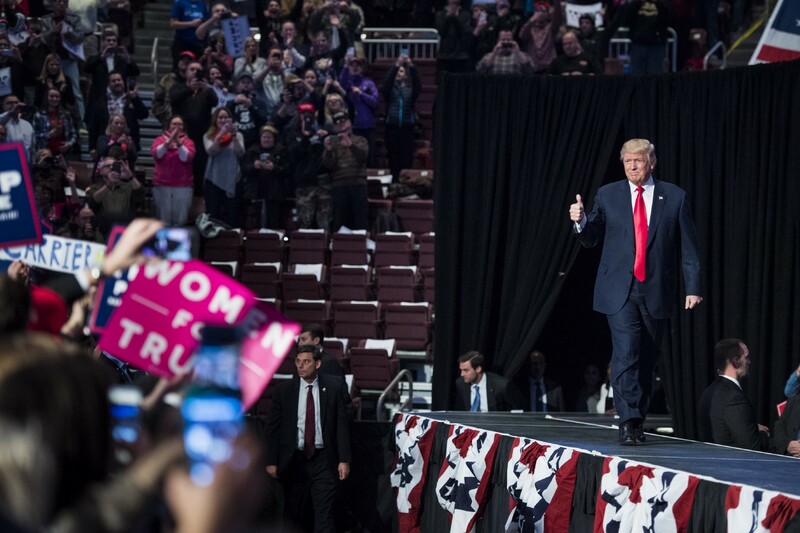 Seemingly unaware or disinterested in the fact the campaign is over, Trump embarked on a “Victory Tour” — later, rebranded as a “Thank You Tour” — visiting only the states he won. His first rally in Cincinnati was half empty. At the Cincinnati rally, after being egged on by Trump, supporters chanted, “Lock her up! Lock her up!” and Trump did nothing to stop them. Same night, Trump loyalist Cory Lewandowski told a panel that NYT editor Dean Baquet should be imprisoned. In a 48 hour period, Trump did incredible damage to our country’s global standing, conducting conversations with foreign leaders without being briefed by or consulting with the State Department. Trump became the first US leader to have a phone conversation with Taiwan, since diplomatic ties were cut in 1979. Trump explained it away in two tweets. China promptly responded in protest. Trump embarked on a “Victory Tour” — later, rebranded as a “Thank You Tour” — visiting only the states he won. His first rally in Cincinnati, like many that followed, were half empty.